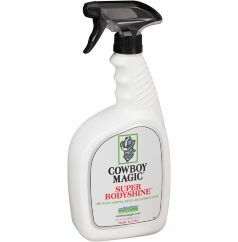 Formulated to reflect a full spectrum of natural light for maximum shine under sun or show ring lights. Contains natural repellants that help resist the accumulation of dust. Provides a long-lasting shine without becoming stick or gummy. For warm or cold weather use. Blended with proprietary ingredients including aloe vera, silk protein & vitamin E.